Several Killed Amid Unrest Spurred By Venezuela Election To Rewrite Constitution : The Two-Way The controversial vote has culminated in more violence between protesters and police, with at least 10 deaths Sunday. Opposition activists see the election as a power grab by President Nicolas Maduro. Members of Argentina's Venezuelan community protest against the election for a constituent assembly on Sunday, in Buenos Aires, as Venezuela holds the controversial vote. Months of opposition to President Nicolas Maduro's plan to strengthen his party's power has resulted in more fatal clashes on the day of the election. Citing Venezuela's chief prosecutor's office, the Associated Press reports 10 people were killed in Sunday's unrest. The opposition claims 16 people have been killed. "Seven police officers were wounded when an explosion went off as they drove past piles of trash that had been used to blockade a street in an opposition stronghold in eastern Caracas," the AP says. At least two of the dead were teenagers, reports NPR's Philip Reeves. 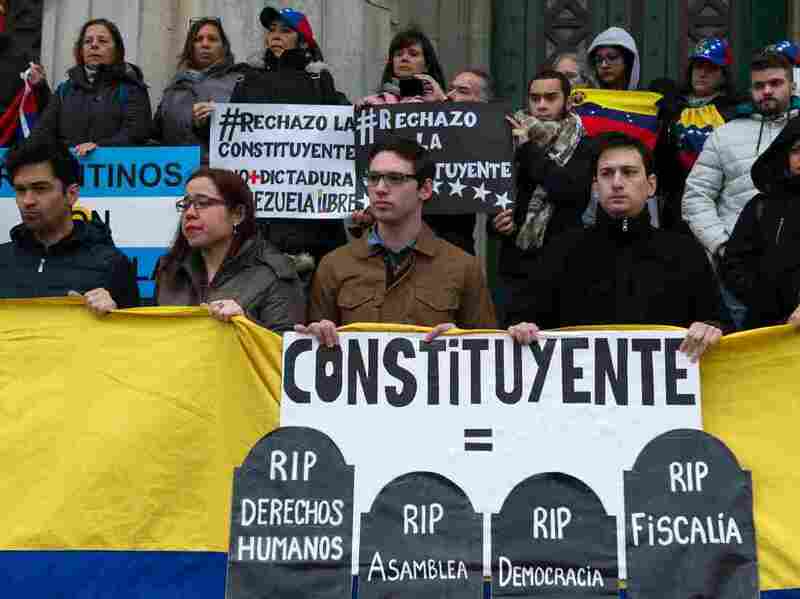 The vote is to create the National Constituent Assembly, composed of new delegates who will rewrite Venezuela's Constitution. As NPR has reported, that rewrite would have the power to dissolve the National Assembly, an opposition-heavy body of lawmakers. The government says that 8.1 million people voted, or 41.5 percent of eligible voters; however, the opposition disputes that figure, saying no more than 12.4 percent had shown up at the polls. Meanwhile, multiple media reports and social media said polling places were near empty in the Caracas, the Venezuelan capital. Opposition parties, who boycotted the vote, see the move as a step towards dictatorship, NPR's Reeves says. So does much of Venezuela's public, who've long expressed no appetite for the new assembly. Two weeks before Sunday's official vote, opposition activists held a symbolic referendum: 98 percent of voters rejected Maduro's call to rewrite the 18-year-old constitution. Beyond internal opposition, the election is drawing intense international criticism. U.S. ambassador to the United Nations Nikki Haley called the election a "sham" on Twitter. The U.S. has already imposed sanctions on senior Venezuelan officials over this election, and is promising more. The State Department released a statement Sunday, condemning the election. "The United States stands by the people of Venezuela, and their constitutional representatives, in their quest to restore their country to a full and prosperous democracy," department spokesperson Heather Nauert said. A growing list of other nations are refusing to recognize the vote, including Canada, Brazil, Argentina and Mexico, NPR's Reeves says. This didn't deter President Nicolas Maduro declaring the election a huge success on Twitter, saying many Venezuelans participated.